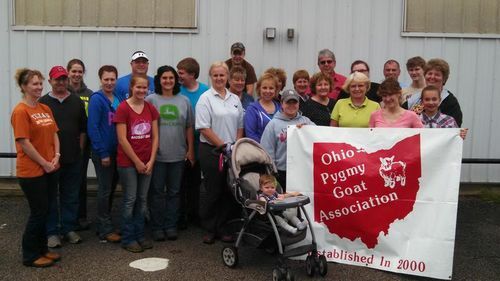 The Ohio Pygmy Goat Association is a group of fun people dedicated to promoting the pygmy goat as well as addressing health issues and furthering our education about these amazing animals! The O.P.G.A. hosts at least one show per year although many of our members and friends also host Sanctioned NPGA shows throughout the year in Ohio and nearby states. All shows are open to exhibitors and the general public. You will usually find members and exhibitors eager and willing to answer questions or simply chat with new and prospective goat owners. Also at the show are breeders who have goats for sale from NPGA and 4-H show quality to pets and companion animals. Please join us at a show to discover the joy of being a part of our pygmy goat family! We all have attended our "first" pygmy goat show and became addicted to competing with our animals and making new interesting friends. You do not need to own a pygmy goat to be a member or to join our club. All you need is to have a love for the breed and a desire to learn more. If you would like to join our club and support our efforts in learning more about the health, breeding, and showing of pygmy goats; please fill out the application on the Membership Application page. An individual membership is $15.00 and a family membership is $20.00.